What is a Poster Board? This a type of display board that is used for displaying posters and other flat printed materials. These boards usually come in large sheets and a variety of colors. The size is significantly bigger than the A2. Poster boards can also be light and flimsy. They are mainly used to support photos, sheets of paper, glitter, letters and other small light items during displays. Such things are glued onto the board itself. Due to such kind of usages, poster boards can easily be recycled and reused. They are found in many places including but not limited to drug stores, office supply stores, and classrooms. They are mostly used for event posters, science exhibitions, and other related school activities. Poster boards can come in various sizes but the standard size measures 22 inches by 28 inches. This is close to an A1 size which is bit larger measuring more than 23 x 33 inches. It is however larger than A2. The boards come in a variety of shades and colors. These even include neon colors. The standard size is ideal for displaying projects. It shows off smaller displays. It is recommended for smaller student presentations. A medium sized poster board would measure about 24×36 inches and is ideal for displaying larger projects. It is convenient since it allows a trifold to make it smaller enhancing. Note: Commonly poster boards have a size of 24 x 36 inches. This is enough space to be able to display all of your information without running out of space, it is also a common school and presentation size. I would like to iterate that the current standard poster board size for the largest printers and wholesalers it is in fact 22 x 28” HOWEVER there are some considerations to take in…. Now, a lot of issues with the standard poster board size is students that need a poster board for their project. 22 x 28 is in fact the standard poster board size but it will be too small for a trifold project. For students doing a presentation a 36 x 48 tendered poster board size is recommended. So again, reiterating that for a trifold 9 x 12 eight 46 x 48 standard poster size is ideal as a tip for the headline you can use a 14 to 16 point font and for regular text. You can use 10 to 11 point font for perfection. Good for some display projects and showing off smaller displays. MEDIUM – 24 x 36”. Good for some larger projects possible to trifold this and make a smaller, more portable presentation not recommended for larger student presentations. 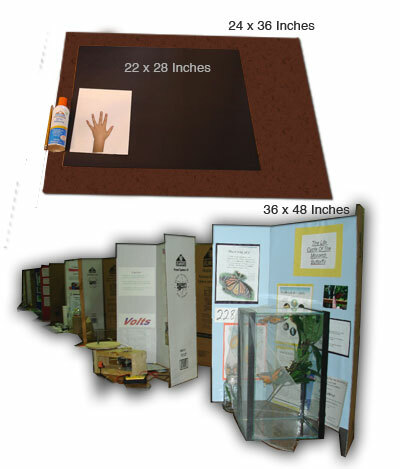 Perfect size for student presentations and presentation such as science projects, tradeshow displays, presentations. Standard poster board size can differ and there are in fact other sizes that do appear that are larger. However, the sizes should be used at your own risk because they are in fact specialty sizes and much more difficult to handle due to how large they are. They can be used for different things such as trade shows and projects but will definitely standout. How thick is a poster board? The measurements of its thickness can be given in thousandths of an inch. A regular 10 pt. poster board would measure 0.010 inch or 0.254 mm thick. A 12pt. one is 0.012 inch or 0.3048 mm thick. This for poster boards in the United States. Those in Britain, except for the White Poster Board, are coated on both sides. A 12 pt. can therefore measure up to 98 pounds. Buyers or users will normally look at thickness in attempt to establish the right kind of poster board that they need. It is not also a guarantee that a thicker poster board is heavier than one that is relatively thinner. The weights will depend on some things including materials and coatings. This a smooth-surfaced heavy paper or light cardboard often used to make cut-outs, stencils, and posters. It is also known as an oak tag. A heavyweight tagboard paper measuring 9×12 inches is ideal for arts and crafts projects. It weighs about 30ponds in actual item weight. Some are however uncoated. This type is exceptionally strong and serves multiple purposes. For example, arts and crafts projects cover a broad range of activities; these tagboard papers can support hundreds of such projects. It works perfectly well for anchor charts and has the same color on both sides. Other good things about this are that they are acid-free and can be recycled and are very affordable. A tagboard paper that measures 18×24 inches has a medium weight. It comes in a hundred sheets per pack. It can be very strong and is also usable for a wide arrange of activities. The weight is about 18 pounds. Just like other smaller ones, these are usually white in color too. Remember aspects such as portability are always very important to consider. It has a relatively higher price than the smaller one measuring 18×24 inches. It however just as thin despite having a relatively heavier weight. It is a flat board that is usually thin in thickness and is a bristol-type and is colored on both sides. It is used for posters, signposts, mailing cards, tickets, cards, tags and many similar uses. It is usually brightly colored or simply white with its double sides both coated. It can be 0.014×0.020 inches thick. Single sheets are 22×28 inches big and are available in assortment packages. This can weigh about 4.8 ounces and a total shipment weight of 8.8 pounds. They usually come in a wide variety of colors. School smart Railroad Boards are usually white in color. They are very good choices for any creative project. The boards are white on both sides and are finished with a clear-smooth finish. You can use one of these for art projects, block printing, mounting, construction, mats, stenciling, markers, painting, and of course posters. These boards are usually sold as a pack of a total of 25 pieces. The professional look allows you creates bold signs and posters that can conspicuously be seen. They are also a very great selection for stenciling and block printing. When your dealing with a science fair project your usually required to use a poster board. Now alot of times a teacher will provide you the size you will need. But I have noticed that even teachers at most times are not sure of the actual poster board size you need. Usually for a science fair project or some other similar project such as a presentation the standard poster board size will be 48″x36″. Usually you can find these boards online or you could head off to your local staples or Walmart. If you have an art supply store nearby that is also a great option. Make sure your information is organized like a magazine would be, with the principle information and title on the top then the most powerful going top to bottom. The most powerfull point of the poster board is usually the top to middle due to the angle, so make sure the most powerful information you have is located there. Another great tip is not to include too much textual information. Too much textual information can be very burdensome for a readers, its better to display lots of imagery to retain the attention of the reader. Text and font: Make sure that your font size is large enough to be read by anyone. Some older readers may have trouble reading small font so a great recommendation here would be to use 16 point font or above. If your struggling to fit your text in you include in small font read more: sections. For things such as pictures and captions don’t worry about a smaller font size you can get away with it. With regards to the title it should be something very large and easy to read if you with to include a little subtitle or description this can be an effective way to summarize what your project is about.Here is a guide of what fonts would be ideal.General: Keep with easy to use basic fonts such as Times New Roman, Arial etc try not to get too fancy we want to be able to see your work! Don’t overuse italic text, this is a big no no. You can use italics for certain areas but don’t make half your project the same. Do not use CAPS this will make your project difficult to read. Do not use cursive or any difficult to read text. Avoid text that is to similar to your background. 3. Photos: You would be surprised by how much a picture can change the entire look and overall feel of a project. A project with just textual information is unreadable and will not retain information after all if you were just going to put a poster board full of text you could have used a booklet. Poster boards can be great tools in selling your ideas creatively to attract an overwhelming response by your audience. This article looks at some of these ideas. There are certain elements that when included can invoke some desired emotions from the viewers or audience. Some get you very excited and energized. Others are full of details. It is, however, critical that you find the right balance between the content included and the headline. You can always add images, logos, and other impressive or professional aspects. If all that is achieved, your poster is fit to go. In the same vein, knowing your prospective audience properly is advisable. This will guide you on which colors to use, fonts, and graphics that complement the overall content. Some of these ideas include the following: Color can be used to energize and invoke different moods. Bright colors invoke a strong feeling of energy and so on. Darker colors relax the audience and allow them to go over the content slowly. Certain colors are bold, some are romantic, irresistible, while others are just cool. Springtime colors which are soft in nature and when used in making an event poster can make the viewer realize that it is an outdoor event from the very first impression. This communicates so much even before the viewer reads the details. Using bright colors for the background and dull colors for the font creates clarity. Visuals on poster boards can be used to grab the attention of the viewer during a quick read. While preparing one, rank your information in order of importance. If working with little information, you can go for bold and simple graphics or a good photo. Lots of information will demand that you focus on your headline and make it stand out. Then you may proceed to group the smaller information in chunks. The fonts and typefaces used can convey a lot of detail. These may seem subtle to others, but typography is an element that can be able to separate two similar ideas and content where one is rated as world class while the other with poor typography is given very little attention. In one of his speeches at Stanford University, Steve Jobs (Co-founder of Apple), stated that if he had not dropped in on one typography class after dropping out of school, the Mac would not have had such multiple typefaces or proportionally spaced fonts. This largely contributed to the success of Apple according to him. Therefore, when choosing a font for your next project, show some seriousness by picking a bold sans serif and enhance elegance through italic serif. A script typeface would denote fun. Less can be more at times. You can always say less by removing too many unnecessary details from your presentation. It intrigues the viewer. One word or one moving image can communicate a lot compared to many empty words. Only use the required amount, never add a unrequired word or unneeded graphics. The audience judges whatever you are presenting through the manner in which you present it, for example, an event poster with minimalistic elegance is taken to be carried on in the same spirit to the event itself. Create a point of concentration for instance by employing the use of photography that is in or out of focus to add more weight to your text. You can also consider cropping an individual photo to show the most significant features vividly. This directs the reader’s eye to only the relevant details. For example, a headline baby can be accompanied by the cropped photo of only a baby’s face rather than the baby’s entire head or body. Shapes can be applied to develop a visual interest Shapes create guidelines which can lead the reader’s eye around the poster. You can put your text inside to ensure the audience reads a particular message desired for original passage. The use of shapes is naturally versatile and undisputedly very efficient. Layering can create desired depth and dimension If you play correctly with your layering of images, colors, and words, you may just get that ultimate look of desired depth and dimension. Thousands of ideas cannot all be placed in one article; it is however quite important to take note of the already discussed ones. With this, you will achieve an output that can stand out among many. Have more ideas on poster board sizes? Leave a comment below!